One of the more surprising things I have been learning by following the reports on the sources of requests for my blog is the large number of them that originate as searches for “flying fish”. I had no idea there was so much interest in that subject. 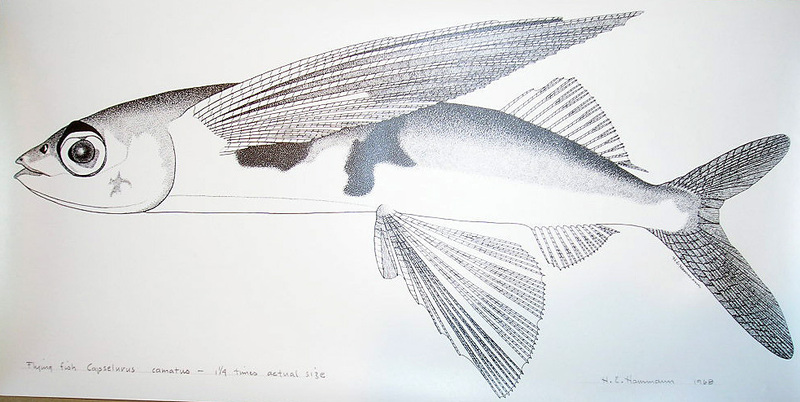 It comes up in my story about Grace Gentry and the meter maid when I describe Mitch Rosen giving a sales pitch while “under siege” and the students looking through my window at a flying fish drawing done by Howard Hammann, a friend and neighbor when he lived in Bolinas. Howard started his career as a technical illustrator doing drawings of dinosaur fossils for paleontologists at UC Berkeley for publication in journals and books. 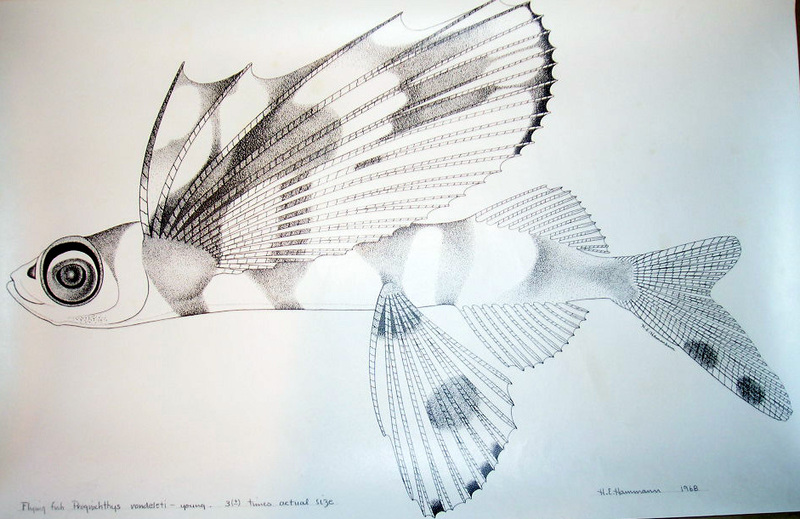 By the time I met him in the late 60s he had become a renowned specialist in illustrations for ichthyologists. It is very slow, painstaking work often done with the preserved specimen on the stage of a binocular microscope (which also made it rather smelly work to boot). When I saw some of Howard’s work I was hugely impressed, not only by the remarkable craftsmanship but by their value as pure works of art. Over the next couple of years I worked on convincing Howard to reproduce some of his fish illustrations, exhibit them and sell them as art works. Eventually he gave in and had several of them photocopied – but he felt that the process lost significant detail that no one but he would have discerned and went over each and every one touching them up with pen and ink. He then exhibited them in a gallery in Sausalito. I don’t think they sold much – apparently other people were not nearly so enamored of the beauty of technical illustration as I was. This strikes me as strange since things like old botanical illustrations are popular as decorator items (the DupontPlaza in Washington had them in every room and even in the stairwells) and old mechanical illustrations are popular collector’s items. When Howard finished the first set he gave me a set of eight and asked me to share them with Bill (William Lee) Butler who was my friend and colleague at University Hall (Office of the President) and was friend of Howard’s dating back to his days in Berkeley. In the interest of providing those “flying fish” searchers a more satisfactory response I am displaying my four in this post. Unfortunately, they are too large for my little flatbed scanner, so I resorted to photographing them and that hasn’t produced the best results. One more point of interest: Howard told me that simple realism is not the goal of such illustration. There are conventional “distortions” designed to meet the special requirements of the variety of fish and the interests of the ichthyologists. 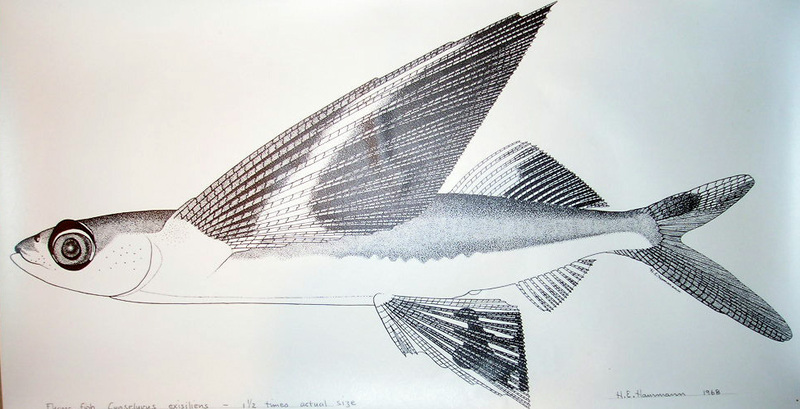 For example, with flying fish the eye structure, the mouth formation and the bone detail in the fins are of special interest. You will notice, for instance, that the fin bones are exposed, the surface “peeled away”. Howard has lived in CarmelValley for about the last thirty years. A few weeks ago a mutual friend, Drake Jordan, himself a well known graphic artist (taught at San FranciscoCityCollege for many years) called to tell me that Howard had died in CarmelValley.